Finally, Apple is starting to gain some serious traction for its Mac range of hardware after what feels like a prolonged period of silence backed by aging hardware. After initial reports suggested that Apple has struck a deal to work with Sonder Design as part of a technology licensing deal, the Wall Street Journal has now weighed in on the discussion with a report which confirms that deal, suggesting that Apple’s 2018 MacBook range will include a keyboard with dynamic E-Ink displays rather than the typical printed mechanical keys. This latest report cites those always “anonymous sources” to suggest that Apple does intend to license and use the Sonder Design technology to form the basis of the new MacBook that will be introduced in 2018. Using the new and revolutionary E-Ink technology in the new hardware would allow Apple to have a truly dynamic keyboard experience by allowing keys to adjust based on user requirements to show things like emoji characters and special command functions. Part of Apple’s roadmap to actually make it to that stage is expected to be unveiled on this October 27th at its own Town Hall arena. That event is expected to see the introduction of a next-generation MacBook Pro containing a dynamic OLED touch bar that would sit across the top of the current mechanical and traditional keyboard, and support for Touch ID biometric security. There’s no suggestion whatsoever that Apple will introduce the E-Ink system into this year’s MacBook range, or in any following hardware that would make an appearance in 2017. It would however put the company in a great place to introduce one of the biggest changes and refreshes to the Mac range in recent times. The interesting thing with this potential solution is the dynamic nature of the hardware that end-users will directly benefit from. 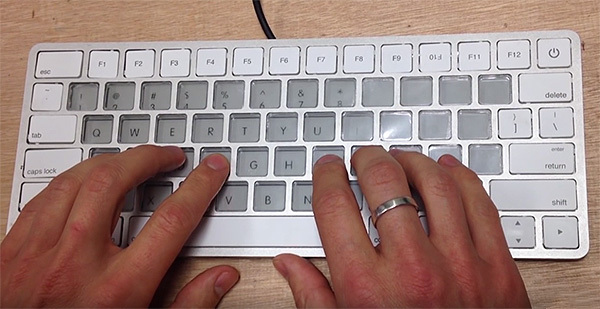 An introduction of this nature would essentially mean that each key on the new E-Ink keyboard could be mapped across to pretty much whatever the user wants. Support for additional languages could be baked into the experience, along with Apple being able to instantly provide visual access to emoji characters and other elements that have previously been hidden away due to lack of space. We’re still a couple of years off from this actually becoming a reality in consumer-facing Apple hardware, but after allowing the MacBook range to stagnate in recent times it’s great to see that changes are on the horizon. A bright one, you are not. Irresponsible reporting… rename the headline to “Macbooks MAY feature E-Ink keyboard”…. There has been no confirmation that this is true!! People that speak/type in two or more languages will benefite the most!